HELP - I need suggestions, again. Thread: HELP - I need suggestions, again. I had posted a picture before asking what color to use for the sky in a "Flying Geese" quilt. I thought I knew what I wanted & then some suggested a gray. Which I had not even thought of. So now which one would you choose for the sky? The one on the left or the one on the right. Thanks for all suggestions. I would choose the lightest. It will give you a good background for the beautiful colors. The lighter one on the left. ​Lighter one for more contrast. Can you find an even lighter gray? I like the lighter gray with the darker colors, and the darker gray with the lighter colors. That didn't help much, did it? I like the lighter one. So far everybody agrees with my husband on the lighter gray. I had thought the darker one for a stormy looking sky. I like the lighter grey. I like the lighter one. but that is just me. if you want it to look more stormy then go darker. maybe a slightly bluer grey more of a stormy color to me but that is kinda what a stormy sky looks to me like a dark blueish gray. I like the lighter one and I think it will be a wonderful combination. Please share when it is finished. I just love those fabrics. I like them both. Those are some awesome colors for your geese. I also like the darker one. It is richer looking to me. The other is very pale and not saturated with color like the geese are. The dark one falls into the back ground and the light one come forward. I covered up half the screen to see which one looked best to me, imho. Last edited by ube quilting; 06-24-2013 at 01:14 PM. The lighter one or black. I would pick the darker one. Actually, you might be able to use both - maybe the dark one in the top, lighter one underneath - or dark one going in an arc across the quilt - something to play with and think about. Both look good. I love the idea of darker for a stormy look. This is what I was thinking, too! Often a rainbow is seen at the end of a storm when the sky is changing from dark to light. Going to be a beautiful quilt. Like them both, but I'd go for the darker one. JMHO. 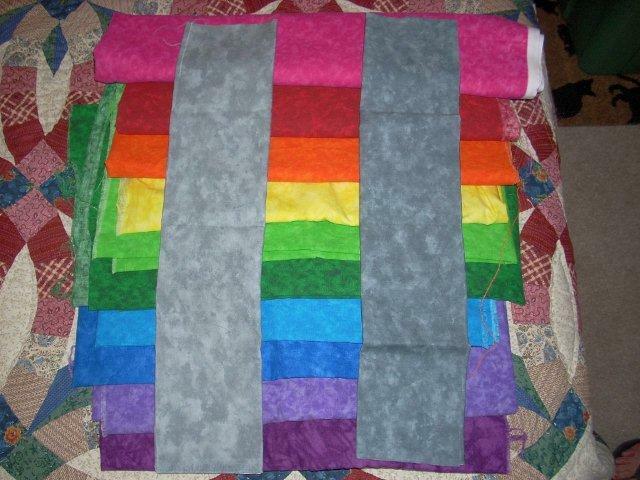 Please, post a photo of the finished quilt...your colors are beautiful! I think they are both good, but the darker one adds a little more drama - would be my choice. I agree with using the darker gray for a better contrast. So that's what it will be. I do thank everyone for there opinions & suggestions. This is one to do in the fall.